The global energy demand is increasing day by day, with which substantial risk to the environment is also increasing. The consumption of the fuel, as well as the demand, is expected to grow rapidly side by side, and use of fossil energy is causing harmful impacts on the environment. All these factors have greatly attracted the attention of the researchers to find some alternative renewable resources of energy. Biofuels are an outstanding instance of renewable energy which can be produced using biological organisms which will ultimately cause a reduction in dependence on fossil fuels. Thus, biofuels are an attractive and feasible source of renewable energy on contrary to the geopolitical instability, finite nature, and deleterious global effects of fossil fuel energy. Biofuels are basically the energy-enriched chemicals that are generated either directly through the biological processes or from the chemical conversion of the biomass of prior living organisms. Biofuels are chiefly produced by photosynthetic organisms, including photosynthetic bacteria, micro- and macroalgae, and vascular land plants. Among all these organisms utilized, microalgae are being considered to be the most attractive source for production of biofuels. The biofuels production is still challenging at commercial scale, and new strains with commercial potential are still needed to be explored more. 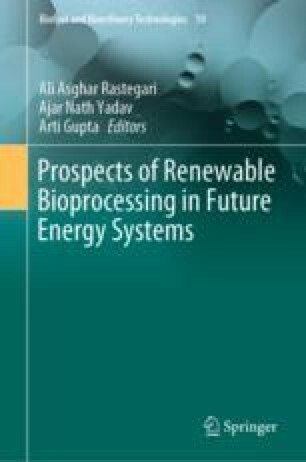 The combination of multiple genetic engineering strategies for optimizing the biofuels production will surely be useful. Thus, to overcome the energy crisis, the global cooperative efforts are very important for transforming biofuels into our current energy system that will further aid in cultivation methodology development as well as technology advancement of biofuels production. The authors are grateful to Prof. Harcharan Singh Dhaliwal, Vice Chancellor, Eternal University, Baru Sahib, Himachal Pradesh, India, for providing infrastructural facilities and constant encouragement.